More folks are just wearing athleticwear for comfort, not sport. U.S. activewear sales were $33.7 billion for Fiscal 2013, representing 16% of the global market. 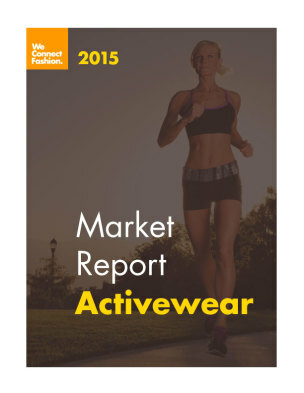 The estimated CAGR for activewear is 4.1%. Opportunities are wide-open for activewear. The wearable market is estimated at $50 billion and Ralph Lauren is rushing to grab a piece with smartwear: activewear + tech, like t-shirts that monitor heart rate. The plus-size market is screaming for more options. Boomers’ wallets are bursting at the seams. The recession is over, and activewear needs to keep pace with its customers, their needs, and their wants. Now more than ever, information is key when making any kind of business decision. Our fashion editors have been building reports specific to the fashion industry for over 10 years and this report will give you a strong overview of where the market stands. The USA Activewear Market Research Report provides a comprehensive overview of the entire US activewear industry in one superb, value-price package. This report is ideal for assisting in business plan development, major business decisions, new product design and launches and for identifying key industry players, marketing vehicles and entry barriers. Reports are sent as a PDF attachment to your email address within 1 business day after processed payment. We do not print nor ship. All research is conducted secondary and from information that can be found in public domain. Our expert fashion editors compile this information into comprehensive market reports, supplying your business with the intelligence it needs.